QFI was a San Francisco-area chain founded in the late 1940s by John Musso. At its peak, about 14 branches were in operation, from Redwood City in the south to San Francisco in the north, and the company was the number three grocery chain in the region, behind Safeway and Lucky. Some departments were originally leased, resulting in some co-named stores such as the pictured Lick Super Market at 7th Avenue and Clement Street. 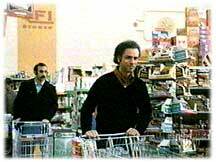 By the 1970s, when Musso’s son Leo took over, the stores were wholly-owned and operated. In 1973, the chain was sold to Cala Foods, which eventually merged with Bell Markets, and was purchased by Ralphs Grocery Company, now a division of Kroger stores. Several of the following images are taken from an episode of TV’s “The Streets of San Francisco” from 1972. The store is located at 350 7th Avenue in San Francisco and is currently a Smart & Final location.